Our Estate Flight is available in our Tasting Room every day of the week from 11am until 5pm, although we request the courtesy of a reservation 24 hours in advance for parties of 6 or more. Our Estate Flight always features five wines showcasing our finest Chardonnays, Single Vineyard Pinot Noirs, and Cabernet Sauvignon. This Flight is always complimentary for our Nos Amis Club members and just $20 per Flight for everyone else. Our Cellar Tasting Flight is available in our Tasting Room every day of the week by appointment, and features five library selections, showcasing older Single Vineyard Pinot Noirs, Zinfandels, Merlots, and Cabernet Sauvignons. This Flight requires a reservation 48 hours in advance and our Nos Amis Club members can elect to upgrade to the Cellar Tasting Flight for $20, and it is priced at just $40 per Flight for everyone else. Our Wine & Cheese Flight is a great upgrade to our Estate Tasting Flight, and is available in our Tasting Room every day of the week from 11am until 4pm. It takes our Estate Tasting Flight, which always features five wines, showcasing our finest Chardonnays, Single Vineyard Pinot Noirs, and Cabernet Sauvignon and pairs it with four imported cheeses, olives, local hazelnuts, and Turkish apricots. Our Nos Amis Club members can elect to upgrade to the Wine & Cheese Tasting Flight for $20, and it is priced at just $60 per Flight for everyone else. Our Picnic Lunch & Estate Flight is a great upgrade to our Estate Tasting Flight, and is available in our Tasting Room every day of the week by appointment. 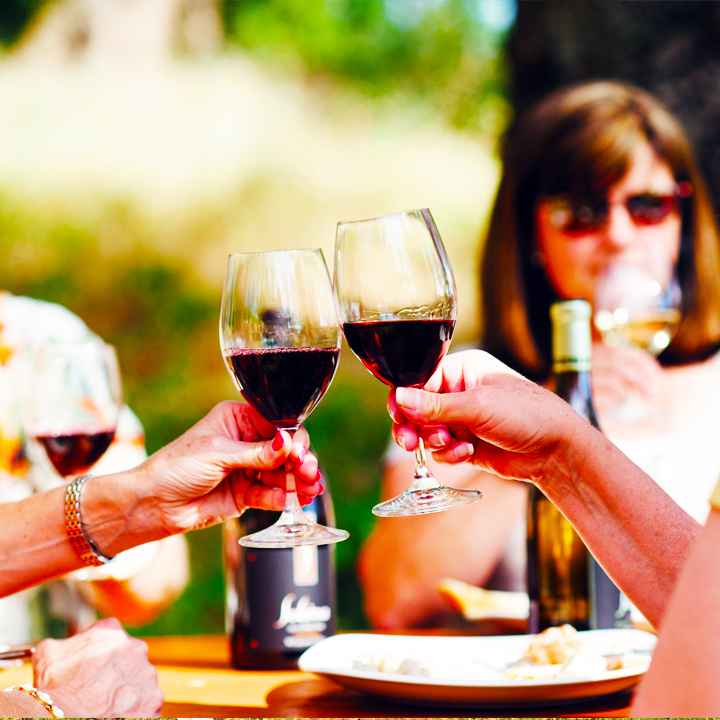 It takes our Estate Tasting Flight, which always features five wines, showcasing our finest Chardonnays, Single Vineyard Pinot Noirs, and Cabernet Sauvignon and pairs it with your choice of delicious picnic lunch options from local restaurants. This Flight requires a reservation 5 days advance and our Nos Amis Club members can elect to upgrade to the Picnic Lunch & Estate Flight for $40, and it is priced at just $60 per Flight for everyone else.